It's challenging to get students thinking positively about learning sometimes. When you're young and impressionable you're experiencing a multitude of sensations and experiences you don't always understand. Being a student is tough, so struggling with learning can seem like the end of the world. As teachers, you're in a unique position to guide your students through more than just the day's lesson. You're helping them learn to manage life lessons and skills for long-term success. Additionally, you're teaching them that useful failure is a real thing. Ultimately, the whole idea of teaching is to teach your students not to need you anymore. Once they leave us they should go forth knowing they can succeed and thrive using what we've taught them. In order to do this, we must ensure they are lifelong learners. That means we must get students thinking positively about not just learning but also about failing and trying again. When Norman Vincent Peale published The Power of Positive Thinking in 1952, people were divided on the credibility of the New Thought movement. While some firmly believed in the doctrines it proposed, others remained skeptical. However, the idea of thinking positively has flourished amid continual scrutiny and derision. Thankfully Peale's book uses science and logic rather than theoretical musings to demonstrate its benefits. The message is clear: if understood and properly applied, positive thinking works. The big misconception about positive thinking is that it ignores what is really happening in the moment. This is a fallacy because true positive thinking is about thinking on purpose, not living in denial. It's a practice that allows us to accept and live with turbulent emotions and mental states while keeping a firm focus on our end goal. Positive thought lets us overcome mental and emotional barriers, and gives us the tools to manage them. It doesn't mean ignoring them and pretending they're not there. Consequently, when we get students thinking positively we help them develop these tools themselves. That's how we can empower them to fall in love with learning. You may have seen the above image somewhere before. If you have, you know it's a great demonstration of how positive self-talk makes a difference to our outlook. The way to get students thinking positively about learning experiences is through simple tools like this. Above all it's crucial students understand that, in the moment of crisis, they have the ability to choose what they think. There's an old saying: no one can make you feel bad without your permission. It applies just as much to what we say to ourselves as what others say to us. All of us have the incredible power to choose how we think. Our journeys are shaped by the thoughts we think and the feelings we feel, and these are all our own personal choices to make. What we choose shapes our lives and that is our inner power. It can serve us or hurt us, but the choices remain ours. What happens to your students' thought patterns in a time of difficulty with learning? Do they panic and seek help, or does their resolve strengthen? Do they shut down or do they strive to find a way to solve the problem? Its in those time you can facilitate learning by how you get students thinking positively. This is just one way to get students thinking positively when they fear failure. Take a look at some more encouraging things you can say for instantly creating better learning. 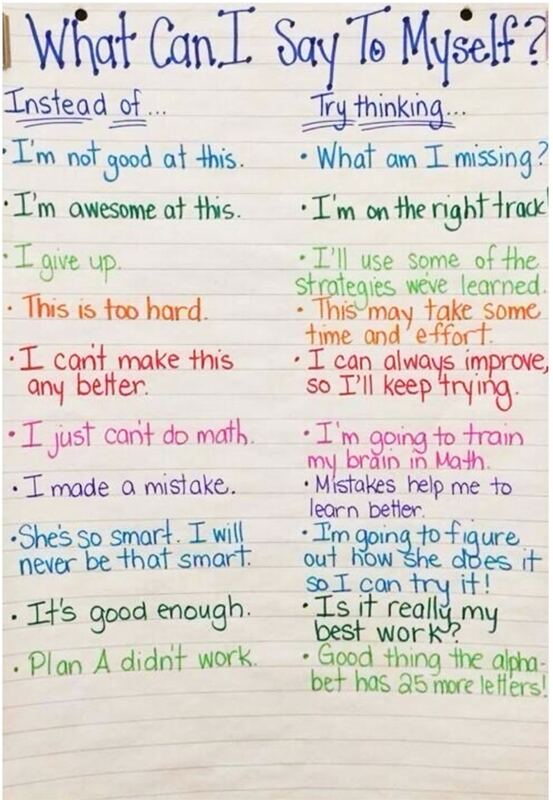 Adopting a shift from a fixed mindset to a growth mindset is another way to get students thinking positively. The infographic below is available as a poster-size file for placing up on a wall in your classroom. Students can remind themselves every day how powerful positive thinking can be. Another poster you might find useful is this one about "mind viruses." It features some of the most common negative self-talk phrases you'll hear from students. Beside each one you'll see the prescription for better thinking, and better learning. The quest to get students thinking positively need not be a chore. In fact, it's an experience you can learn from together as teacher and student. When you share the practice of positive thought, you share in the rewards of a deep understanding of yourselves and each other. This translates to less fear of failure, and more love for learning.